Powers/Abilities: Otomo has the power to fly. He is also impervious to bullets and is super strong (class 10?). Otomo is also skilled in martial arts, and is a specialist at destroying cybernetic and robotic opponents. History: (X-51#6 (fb))- At the end of World War II, an unknown scientist was developing a formula similar to the Super-Soldier Serum for the Japanese powers. When the Allies came for him, the scientist drank the serum. The serum had no immediately discernable effects, as the scientist exhibited no superhuman abilities. Eventually the scientist married and had a daughter. The daughter later died in childbirth and the Japanese authorities took her son, Otomo. The Japanese government made him into a hero, and he became renowned for his proficiency against cybernetic and robot opponents. However, Otomo was dying because of his powers, so the Japanese made an antidote to save him. The Japanese controlled him with it until Shinobi Shaw synthesized the drug, bringing Otomo into his service. When Shinobi Shaw was deposed by his father Sebastian Shaw, Otomo transferred his alliegiance to him. (X-51#5)- Sebastian Shaw contacted Otomo in Japan and ordered that he destroy Machine Man for him. Otomo agreed, but noted that afterward, his debt would be considered paid in full. 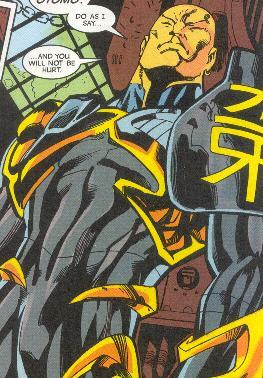 (X-51#6)- Otomo captured Machine Man's friend Peter Spalding so that Machine Man would come to him. Jill, Peter’s wife, called Machine Man, and he set off to rescue Peter. As Otomo waited for Machine Man's arrival, he narrated his origins to Spaulding, and Spaulding observed that Otomo was little more than a slave. Otomo, however, did not care, and was concerned only with destroying Machine Man. When Machine Man arrived, he and Otomo fought, and Otomo managed to tear Machine Man apart-- but his nanotechnology to rebuilt him. Otomo had to admit that Machine Man was superior to him, but then he began to convulse, desperately needing more of Shaw's drug. Machine Man helped administer some of the synthesized drug, deciding that because of Otomo’s honor he wouldn’t attack him again. (Civil War Battle Damage Report#1) - Otomo attended a press conference with the members of Big Hero Six as well as the robot Red Ronin, reaffirming their stance on protecting Japan from superhuman threats. Comments: Created by Karl Bollers, Mike Higgins, Joe Bennett and Bob Wiacek. Kyle Smith notes that Otomo is reminiscent of Magnus, Robot Fighter (of Gold Key/Acclaim), the martial artist-robot fighter.